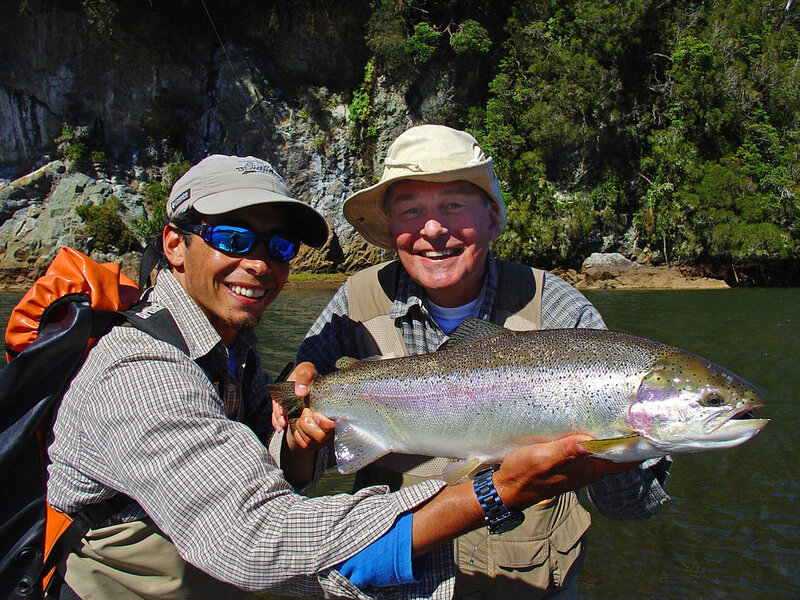 Fly fishing remote rivers in Chile for resident and sea-run Rainbow trout, Brown trout and Silver Salmon. Fish amidst one of the most beautiful settings for fly fishing in Chile. River Fly fishing & cruising along the smooth inland sea in the Fjords of Chile. Wade-fishing only. Fish up to 10 virgin rivers per week. Fishing is done by wading remote rivers, we do not fish from boats. You will navigate a vast smooth inland waterway 60 miles from open Ocean. Conditions are similar to navigating a big lake full of islands and protected bays, ideal for mooring in safe and quiet comfort. 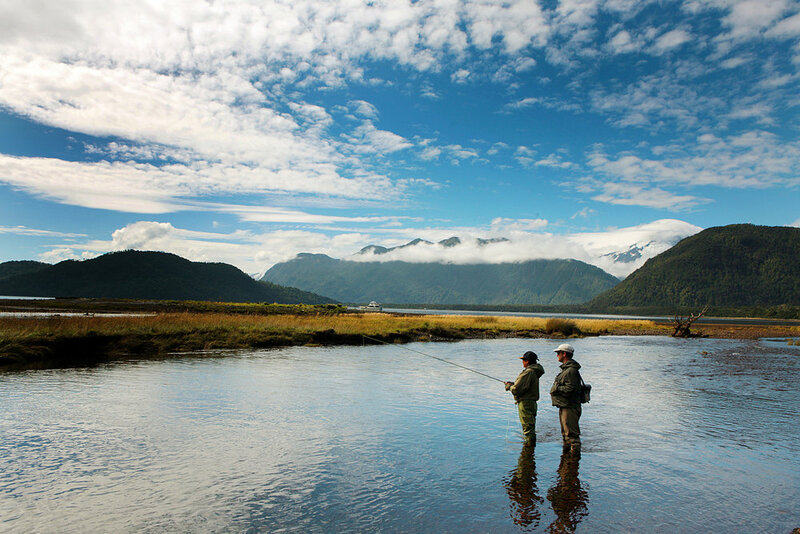 Expert guides take you ashore daily to enjoy fly fishing excursions for big Trout or Salmon in virgin crystal-clear rivers of the Chilean fjords. Each Sunday morning to 4 guests embark on the M/V Rio Azul, a luxurious, fully equipped 53-ft. Hatteras cabin cruiser. The program is a week fly fishing at least eight different estuary streams of crystal-clear water that yield hard-fighting trout and salmon. Guests disembark Saturday morning at the base port. Puerto Chacabuco, Chile. Cruise an area of breathtaking natural beauty and too remote for human habitation yet holding an incredibly rich Trout and Salmon population that has rarely seen a human. Guides operate motorized inflatable boats to take guests ashore after only 5 to 10 minute motoring. 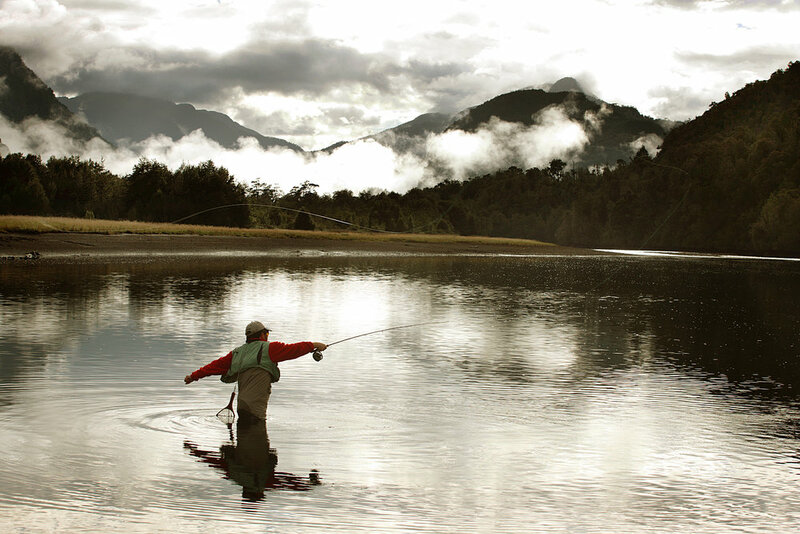 The Dufflocq family, a signature of service excellence in Chile, manages this fly fishing operation on its 14th season. The yacht accommodates 4 guests in two double staterooms each with private bath and shower. Commodious dining and living areas, and ample exterior decks for wildlife observation. A crew of 4 use separate crew facilities. 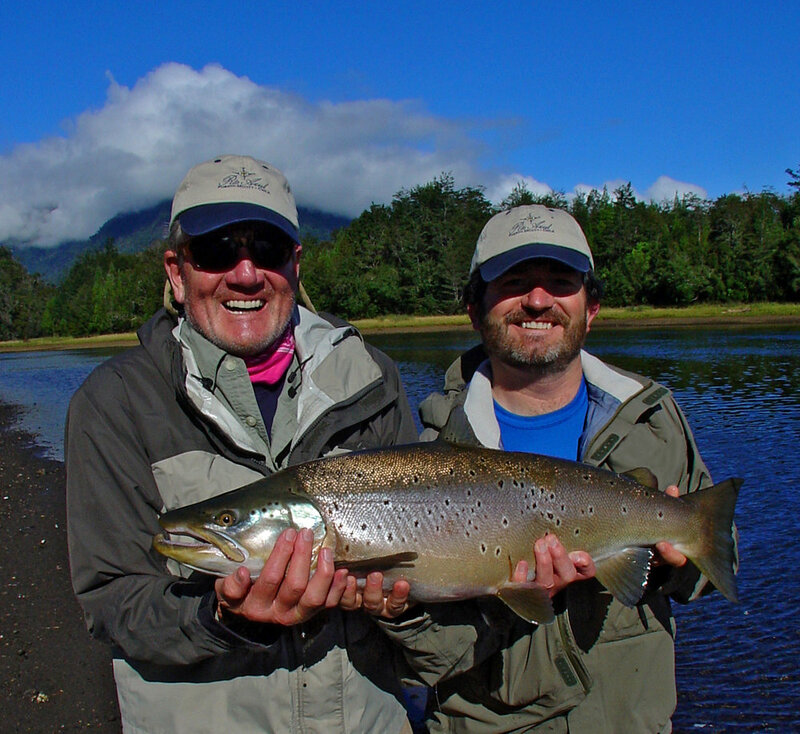 A very experienced captain, excellent cook and two professional guides attend to your safety and comfort to make the fjords cruise a truly unique fly fishing adventure in Chile. Apart from very large trout and salmon, during our journey, we will see penguins, sea lions, marine and inland birds, and one of the world's rarest sea mammals - the five-foot long black dolphin of Chile. All this aboard a comfortable, safe and fully equipped 53 foot Hatteras motor yacht. Saturday arrival : Arrive to Santiago Chile`s capital. From the same terminal connect the next available flight South to Balmaceda (Coyhaique), this normally takes three hours total including a stopover in the city of Puerto Montt. Upon arrival in Balmaceda airport, you will be met by one of our representatives outside the only baggage claim exit door. After scenic two hour drive West to Puerto Chacabuco, a small village located at the Eastern end of the Aysen Fjord, you will overnight in a great hotel with beautiful views to the bay and excellent cuisine. one of our vehicles will pick you up around at 9:00 am for a short 5 minute drive to the dock where you will board the yacht and meet your host, guides and crew.The yacht departs right after boarding. We go through maps showing the different rivers and fjords while we navigate towards our first fishing destination. The head guides helps you gear up and makes a selection of flies while he describes the different fishing situations you will encounter. After lunch we approach our first river and get ready for your first session of great fishing. The captain throws the anchor and lowers the Zodiacs, a short 5 minutes ride will put you ashore. As you walk up the clear river with beautiful pools and runs, your heart beats with excitement, eager to begin your fishing adventure. There are no signs of anybody in miles, no tracks in the sand, truly a virgin river. You select the fly and try few casts against the far bank in the perfect pool, suddenly you see a golden flash followed by solid strike, you have hooked your first fish in the fjords of Chile ! We return to the boat after a few hours of great fishing and are greeted by the chef with Pisco Sours (a typical Chilean drink) and hors d'oeuvres. Later you will be invited by the Head guide to join him for a delicious dinner while we hear fresh fishing stories and the next day's plans. Monday-Friday: After an early breakfast the boat navigates through the fjord to the mouth of the river. Upon arrival, Zodiacs will take us quickly to shore. The guides are able to contact the boat by radio in case we need some assistance or to bring us the reel or camera we forgot on the boat. Once on the river, a short walk upstream to choose our first pool or run and we begin our fishing adventure. For the more adventuresome explorers a hike further up the valley is an attractive option. 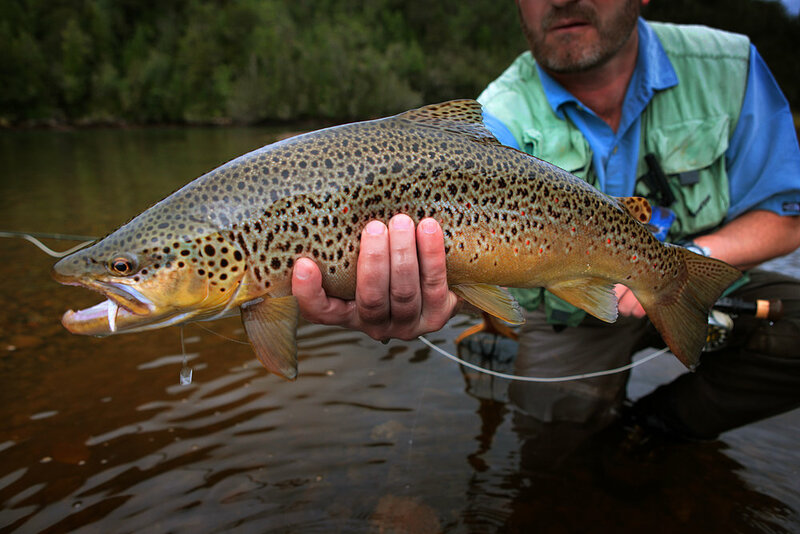 The fish are usually powerful and big, the average size being around four pounds, which is very good for Rainbow or Brown Trout. Fish over ten pounds have been taken on every trip. Larger fish of 12, 15, 20 and a record Brown of over 25 pounds have been landed. Also, many large fish have broken off. If you want to catch the largest fish of your life on a wonderful setting, this is the place. Apart from fishing, the surroundings are magnificent tall mountains covered with temperate rain forest almost to the snow line. The area we are fishing has no access by road and is one of the most scenic places in Chile. With absolutely virgin waters and forests, this is truly a unique setting. In general a day’s fishing program flows as follows: After an early breakfast, the Zodiacs will take you and your guide to shore. We will fish until around 2:00pm, then we either go back to the boat for lunch and a "siesta" or, have a stream side lunch, so we can continue fishing until day's end. Then we will return to the yacht for a hot shower, cocktails, and a delicious dinner. During the week we usually have 4-5 fjords to fish, each with one, two or more rivers flowing into them so in a week we will fish from 8 to 10 rivers. Some of the rivers are quite long, and you can walk upstream quite a distance. Others we fish only a couple of hundred yards from the mouth. We will move the boat as required by conditions and if the river is fishing well, we stay longer. Flexibility is the name of the game when you have the option of moving your " lodge". 9:30 AM the boat will be dock in Puerto Chacabuco. Departure from the boat for a two hour drive to Balmaceda airport and connecting flights to Santiago and beyond. Program: 6 days and 6 nights. Sunday to Saturday. Maximum group size: 4 guests. Use of boats as required by activities. Local Airport transfers to from base port.